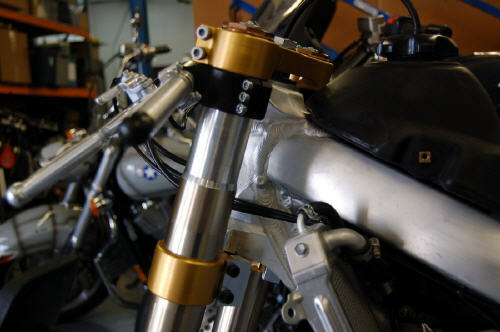 OPTION 1 - Buy a Sport Bike front end, make a steering stem, revalve with Gold Valves and re-spring for the new bike weight. The problem with this option is Sport Bike front ends are too short to get proper rear-end geometry (about 120mm [5"] depending on the model). The front end geometry can be quite good if you know what you are doing with the rear end. The shorter front end means you will need to run a pretty flat swingarm angle. This means the Anti-squat percentage is also low. The best you can do is carefully setup the shock length and travel. If you don't properly setup the geometry it can be dangerous. OPTION 2 - Shorten the stock forks, add Gold Valves and springs, replace the triple clamps to get proper geometry (this is critical), and replace the fork bottoms (axle holders) to allow using Radial-Mount Calipers for strength. We will have both the Triple Clamps and Fork Bottoms available. This option has the added benefit of increased rigidity of the larger diameter forks and, depending on your situation, is less expensive. Pricing is in the $2500 range for the complete package.